If you’re planning to propose soon, it’s probably all you can think about. Will she like the ring? Is the timing right? Will she say yes? That ring is probably burning a hole in your pocket while you search for the perfect time and place. Birmingham Botanical Gardens (2612 Lane Park Road, Mountain Brook). Located just beyond Mountain Brook Village, the Birmingham Botanical Gardens offers a variety of outdoor options depending on the season, from the Ireland Iris Garden to the Dunn Formal Rose Garden. There are even some indoor alternatives that still promise beautiful, colorful photo opportunities such as the Samford Orchid Display Room or the tea house. The Observation Deck at Vulcan Park and Museum (1701 Valley View Drive, Birmingham). A trip to the top of the world’s largest cast iron statue offers both a breathtaking view of Birmingham and a glimpse into the city’s steelmaking history. You can start the day with a hike along the Centennial Park & Vulcan Trail, or save your energy for the 150-plus steps to the observation deck (there’s also an elevator if stairs aren’t your thing). Weather permitting, the deck is open until 10 p.m. most nights so you’ll have a sparkling city skyline for your backdrop. Temple of Sibyl (154 Montgomery Highway, Vestavia Hills). Modeled after the Temple of Vesta in Rome in 1924 – namesake of its home in Vestavia Hills – the classic-style circular temple sits atop Shades Mountain and offers an unmatched view of Samford University and Shades Valley. The temple itself can be reserved for private events – including weddings – and closes at dusk, so if you want to ensure a private proposal, you might consider calling to check scheduled events first. Your Favorite Restaurant. 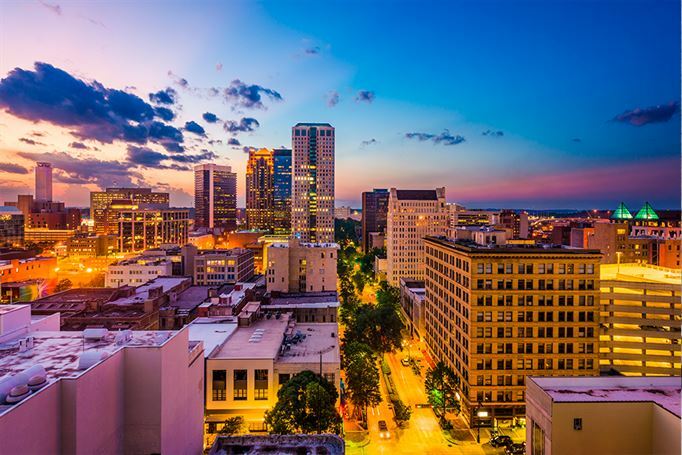 Birmingham has been fortunate to have some of the country’s best restaurants – and award-winning chefs – right here in town. You can choose a perennial favorite like Highlands Bar & Grill, Cafe DuPont, or OvenBird. Or select a relative newcomer such as FoodBar or Galley & Garden. Better yet, consider an eatery that’s special to the two of you, even if it’s a low-key spot or a meat-and-three. Anywhere that’s uniquely yours. Quite possibly the most romantic place you can choose for a proposal is someplace that’s meaningful to you as a couple. Something that has history for you, whether it’s your favorite movie theater, the library steps at the university you both attended, or the high school parking lot where you first met (yes, that’s where my proposal happened! ), any spot can be the right spot if it’s important to you. Whatever spot you choose, chances are you’ll make the right decision. A proposal is a very personal thing and a reflection of your relationship together. As long as it’s heartfelt and sincere, it will be romantic. And no matter where or when you pop the question, it will become one of the most romantic chapters in your story as a couple.